A wet dust collector is required for the safe collection of combustible metal dust such as aluminum dust collection, titanium dust collection and magnesium dust collection. ProVent’s line of Wet Dust Collectors have also been used effectively in many other difficult applications in lieu of cartridge collectors in industries such as food processing dust collection and pharmaceutical dust collection . ProVent’s unique scrub design has been an industry standard for over 40 years and continues to lead the industry in Wet Dust Collection efficiency. The Uni-Wash Wet Dust Collector fulfills National Fire Protection Association (NFPA) Standard 484 for the capture of combustible metal dusts created in processes involving aluminum, magnesium, titanium, and zirconium. If your process involves any or one of these materials, Uni-Wash Type Dust Collectors will greatly decrease risk of fire and explosion in your facility – keeping your workers and your product clean, safe, and compliant. Units are self-contained and require little or no water after filling. Installation and start-up are simple. The Uni-Wash wet dust collector has also been used successfully for other difficult applications other than combustible metal dust. The pharmaceutical industry, as well as, the food processing industry has embraced wet dust collection as a way to filter errant dust that has been difficult to capture with dated cartridge collection. 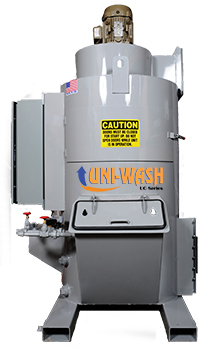 Uni-Wash wet dust collectors are fully complaint with the NFPA 484 standard when purchased with the NFPA 484 package. Click here to find out more about NFPA 484.